It’s not that Nyel saw his shadow yesterday – although X-rays do look pretty shadowy. 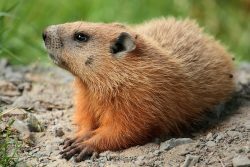 But when the doctor said “six more weeks” before he can begin putting any weight on his broken leg, I swear there was that resigned look we’ve come to associate with Punxsutawney Phil. Not that Nyel would be scurrying back into a groundhog burrow… not exactly. Our house is certainly preferable to living underground. And being able to spend his days in a wheelchair is a whole lot better than being bed-bound as was his fate in 2014 after his quadriceps surgery. But still… six more weeks of leaving the house only with the assistance of the EMTs and six more weeks of bed-baths and shampoo caps and other personal hygiene indignities, to say nothing of six more weeks of putting up with my cooking… A bit stupefying to consider. Nevertheless, that’s the way it is. 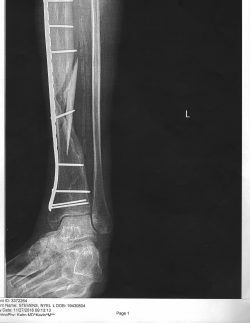 The doctor didn’t mention if the six weeks would have to stretch even farther. And we didn’t ask. We’ll cross that bridge – by foot or by wheelchair – when we come to it. January 9th is, at least for now, the magic date for Oysterville Nyel. No waiting until February 2nd like Phil does… at least we hope not! Keep good thoughts!